This month's featured staff member is game ranger Alex Juawo. Alex is the newest addition to the rangers at Rhino River Lodge but he's fit right in and guests are raving. 1. We know you worked really hard to become a game ranger. Please tell us the story of how you became a ranger at Rhino River Lodge? Growing up in the beautiful mountainous region of Chimanimani in the eastern part of Zimbabwe, my childhood was filled with lots of adventure. I spent most of my time building tree houses, trapping birds and going for picnics along several streams in the mountains. At the age of 11 I was introduced to conservation by Ms. Jan High and Ms. Dee Schaffer. They gave me wildlife books from mammals to trees and instead of shooting birds with catapults I started bird watching and tree identification and really enjoyed it. As soon as I finished high school I went on to do an Outwardbound course specializing in rock climbing, abseiling, and mountaineering with help from Dave Meikle. I worked for them for one and a half years. I moved to South Africa and got a job in Durban as an adventure instructor. After two years in Durban city life wasn’t my favourite so I decided to write a guiding course exam but the challenging part was to find a place to do my practicals as no one was prepared to hire an inexperienced guide! I moved to the Drakensberg where I did lots of hiking. While I was there I contacted Tracey Gold from Bonamanzi Game Reserve and she allowed me to go to their reserve during my days off and shadow their experienced guides. I managed to do my practical assessments and got my guiding qualification. I then moved to Hluhluwe where I began my guiding career at a small game reserve with plains game only. My wish, however, was to work at a well-known big five game lodge. After a year and a half I came across a vacant post for Rhino River Lodge. I applied immediately! A few days later my application was responded to and I had to set a day for an interview. It was quite challenging to compete with experienced guides for the post but I told myself, “I can do it! I just need to give all I can to get the job.” It is so exciting to continue with my career at a big five game lodge situated in a beautiful game reserve with a variety of flora and fauna as well as incredible sightings. 1. What is your favorite part of being a game ranger? Waking up early in the morning, jumping in to the Land Cruiser before the first light and driving in to the bush no knowing what to expect. Every day is a different day and I just love it. 1. Any sighting on the Zululand Rhino Reserve that stands out as your favorite? Eye-witnessing two male cheetah taking down a fully grown kudu bull. It was so exciting seeing the fastest land mammal chasing and taking down an antelope almost twice their size in from of our game drive vehicle but it was also sad to hear the distress call make by the kudu bull as it had its last breathe on earth. The two male cheetah started opening the back and front leg with their sharp incisors before they feasted on their breakfast. We stayed there for about 30 min and when their tummies were full they moved 20 meters into the bush and rested under the tree, keeping an eye on their leftovers. 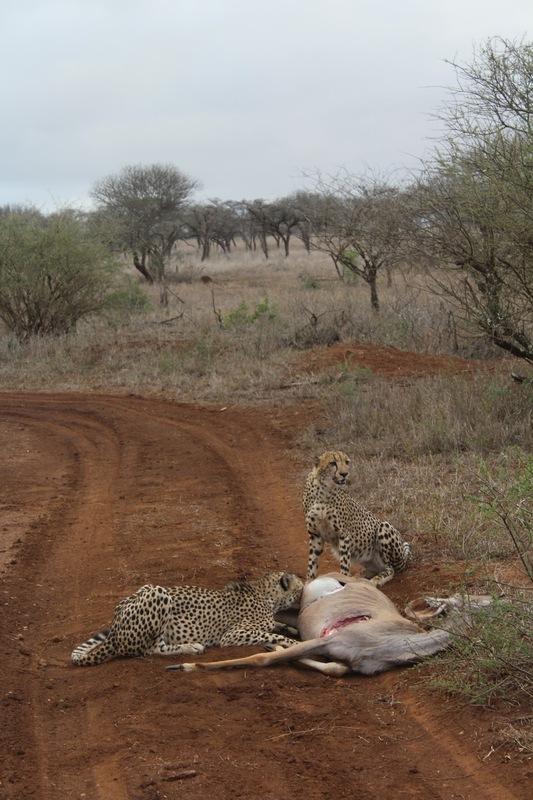 Two cheetah on a kudu kill. Photo by Alex. 1. What species is your favorite to watch on a game drive? 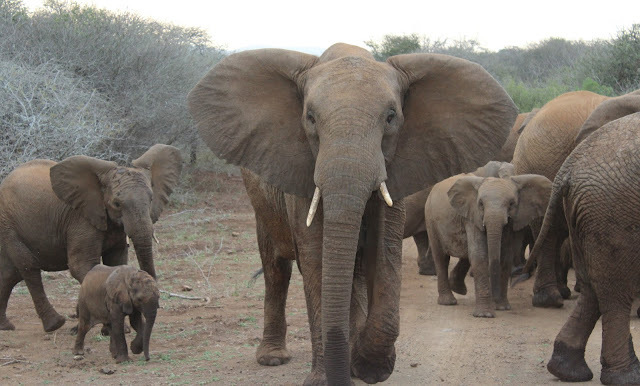 I really enjoy watching a breeding herd of elephants. They help and care for each other especially the young ones struggling to feed or failing to catch up with the herd, the older brothers and sisters come to their rescue. It’s also a learning point for us human beings to learn to help and care for those around us and those in need. 1. What advice would you give young men or women who are aspiring game rangers? It’s an interesting industry to work in but also has lots of challenges so keep working really hard until you achieve your goals and never give up. Hi Alex, so nice to find your story in the newsletter! We have very fond memories of our trip with you in July! It was a fantastic experience. Many greetings from the family: Remco, Saskia, Tim, Lars and Dees!